Pedros Pizza is a great little pizza shop located in Bella Vista. It is run by a group of Italians who aim to provide their customers with authentic and top quality pizzas so that customers will continue to come back for more. Well let's just say they have gone above and beyond any expectations you would normally have for a takeaway pizza shop and they have most definitely delivered a top quality pizza. 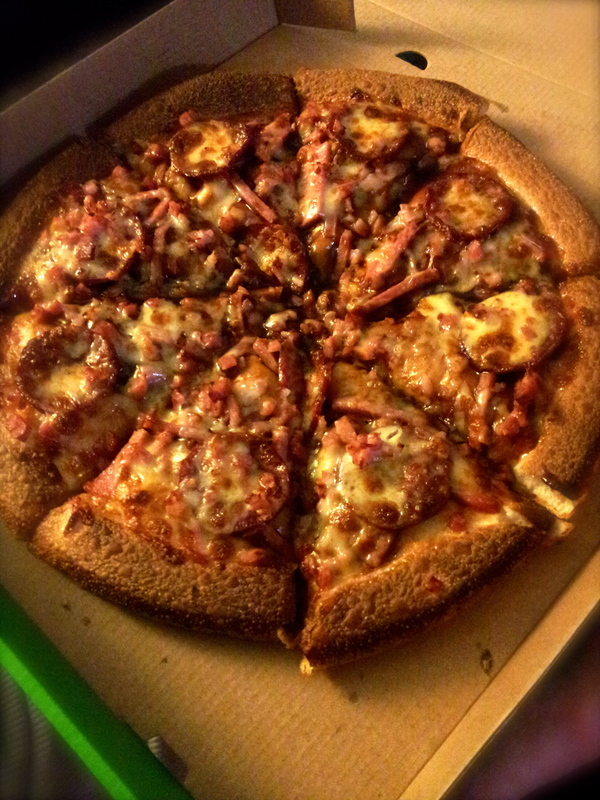 I have recently had Pedros Pizza for my friday night pizza night at my place and originally I was hesistant to try a new pizza place because I was unsure whether they would be any good. But honestly it was a great choice because the Gourmet BBQ Meatlovers Pizza that I had was the BEST pizza I have ever had. It had just the right amount of cheese, a delicious soft base, the right amount of toppings and the pizza just melted in your mouth. It was the perfect pizza; I finished the whole thing. Everyone else in my family who had a pizza thoroughly enjoyed it and said this is definitely going to be our new pizza place. Usually when we order pizzas we get them from Pizza Hut as it's just down the road, but we will no longer be ordering pizza from there as the short 5 minute drive down the road is definitely worth the delicious and tasty pizza from Pedros. In terms of the menu options they have a large variety of pizzas to choose from. They have their selection of Value pizzas which includes Mushroom, Herb, Garlic, Bruschetta and Australian Pizzas. Then they have the Traditional Pizzas including American, Aussie Supreme, Chefs Special, Capricosa, Hawaiian, Meatlovers, Mexicana, Hot and Spicy, Italian, Vegetarian Delight, Napolitano, Garlic Prawns and more. Their range of specialty pizzas includes; Satay chicken, Chicken Hawaiian, Chicken Feast, Seafood, Super Supreme, Spicy Chicken and Tandoori Chicken. They also have Gourmet Pizzas including Gourmet Meatlovers, Chicken, Seafood, Surpreme, Chefs Special and more. They also have three healthy choice pizzas and a selection of side dishes such as salad, chicken nuggets, wedges, chicken wingettes, garlic bread and more. So whatever combinations you are after, Pedros can provide. They also have some locations in South Australia. I highly recommend Pedros Pizza at Bella Vista for your next pizza craving because they produce a top quality authentic pizza which is delicious and tasty. So try it out today. Are you seriously putting this blatant advertisement forward as a genuine piece of journalistic work??? In my experience, these were priced based pizzas. Not gourmet in any way. The picture shown did not reflect the quality of pizzas I have ever received from them. While not a bad pizza... They are unworthy of an unsolicited write up such as this, hence I question your motivation... I hope I'm wrong. I wrote this article with the utmost sincerity! I believe that these were really good pizzas and we thoroughly enjoyed them. I gave them the write up I thought they deserved based on mine and my families experience.